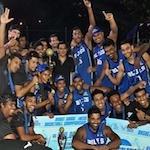 Thirty four teams will vie for honours in the All Island National Schools Basketball Tournament 2008 for boys and girls including 17 boys schools and 17 girls schools which will be worked off in four different venues in Colombo and suburbs from September 11 to 13. All the boys fixtures will be played at St. Joseph's College's courts, Maradana and Nalanda College while St. Joseph's BV, Nugegoda and Holy Family Convent, Dehiwela are the girls' venues. The tournament is conducted by the Department of Education. Both boys and girls defending champions D.S. Senanayake College and Good Shepherd Convent, Kotahena have not qualified for the nationals this time as they were eliminated in the selection tournaments held provincial wise. The teams taking part (boys) - Dharmasoka College, Ambalangoda, Mahinda College, Galle, Siri Dhamma Vidyalaya, Galle, St. Michael's College, Batticaloa, Shivananda Vidyalaya, Batticaloa, Kamel Fathima College, Kalmune, Trinity College, Azar CC, Akurana, A. Ratnayake MV, Walalla, St. Joseph's College, Maradana, St. Peter's College, Bambalapitiya, De Mazenod College, Kandana, Joseph Vaz College, Wennappuwa, St. Anne's College, Kurunegala, Kegalu Vidyalaya, Sussex College, Ratnapura, Pinnawala MMV. (Girls) - Dharmasoka College, Sri Sumangala Vidyalaya, Weligama, Sujatha BV, Matara, Sri Krishna College, Batticaloa, Vivekananda Vidyalaya, Batticaloa, St. Mary's College, Trincomalee, Mahamaya College, Kandy, Pushpadana Girls' College, Kandy, Girls' High School, Kandy, St. Joseph's BV, Nugegoda, Sirimavo BV, St. Paul's Girls Schools, Milagiriya, Holy Family Convent, Kurunegala, Maliyadeva BV, Sumana BV, Ratnapura, St. Joseph's BV, Kegalle, Furguson BV, Ratnapura.